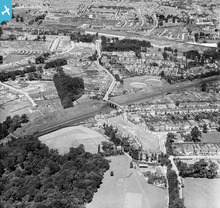 This shot of South Oxhey is taken in the south-east corner, looking north, and shows parts of the estate were already finished on the side adjacent to the main line railway. 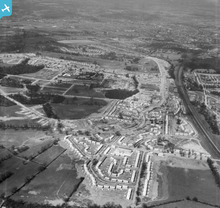 The left foreground and middle distance on this image would see further developments over the next three years, as the LCC housing estate eventually reached its target of 4,000 completed homes, providing accommodation for 17,000 inhabitants. 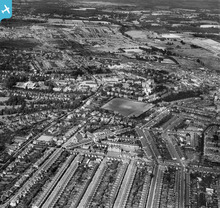 The current population is in the order of 12,500, but this writer would estimate that upwards of 100,000 folk have resided in South Oxhey since its inception in 1946/47. Now there's a thought! 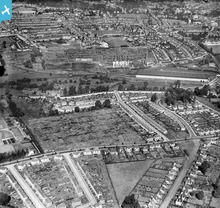 This view is looking in the opposite direction to EAW022130 and is thus a useful complement to the previous image depicting the emergence of the huge, sprawling London County Council estate at South Oxhey. 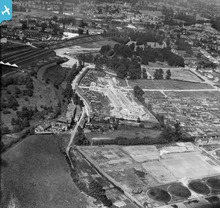 This estate became one of the most significant post-WWII developments in the London Region, with the majority of the 17,000 inhabitants moving out from the over-crowded, war-damaged Metropolis into this greenfield site. 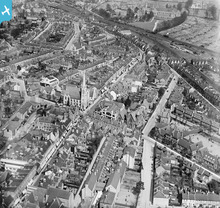 A classic shot of Watford taken looking north-west, along the axis of the famous old High Street, shortly after the conclusion of the second world war, when the population of the town was already over 70,000. 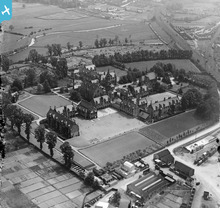 Oxhey Hall Estate is a notable example of Metroland 1930s housing, most of which has been designated a Conservation Area in more recent times. 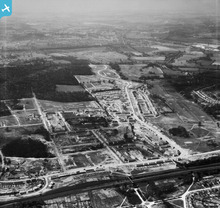 I wonder if Katy and her team are able to uncover some more recent shots from the Aerofilms archive of the area south of Oxhey Hall, which may show the early stages of the post-war London County Council's huge housing estate at South Oxhey, under construction between 1946 and 1950? 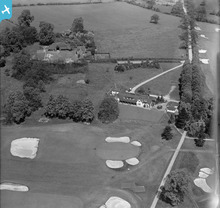 An attractive shot of part of Sandy Lodge Golf Course, looking north-west towards the newly-completed school, with the 1930-1985 Asbestos Works and the 1830-1980 Croxley Mills in the distance. 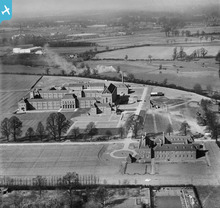 A rare picture of the newly-opened Merchant Taylors' School after its move from the City of London and which continues to thrive eight decades later. In the middle distance and background, in this view looking almost due north, are two of the more important factories in the area, the Asbestos Works and Croxley Mill, neither of which survived beyond the 1980s. 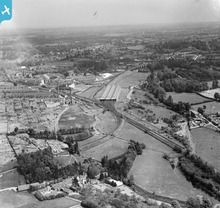 An interesting view, looking towards the north-west from the western edge of Oxhey Golf Course and Hampermill Spring, across an area that was to undergo development in the following decade, with factories set up on Tolpits Lane, between the LMS Railway Branch and the River Colne, in addition to Merchant Taylors' School. Watford is listed in 1936 as the sixth wealthiest town in the country, based on the purchasing power of the 65,000 inhabitants. 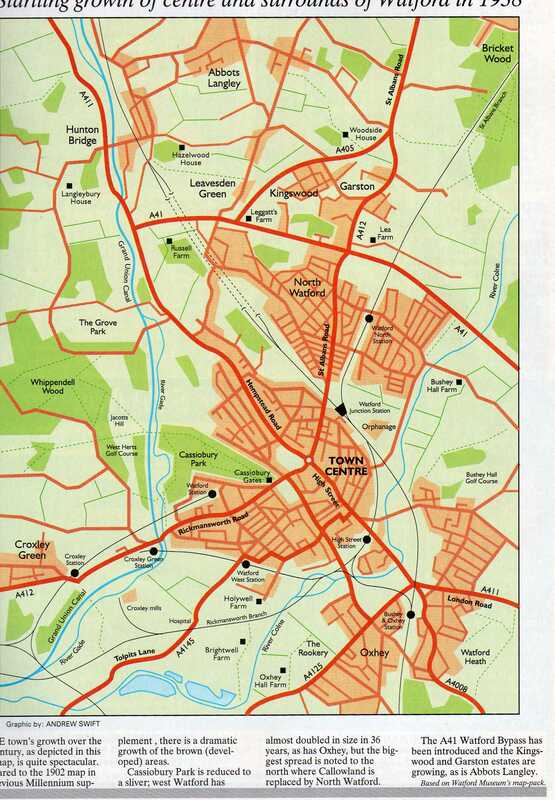 This may not be one of the more salubrious neighbourhoods in the town, but it's worthy of study nevertheless. 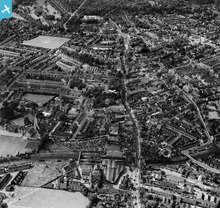 An interesting snapshot of Watford in the early Thirties, when the town continued to grow to around 56,000 inhabitants, from a figure of 45,000 in 1921. Looking north-west in this viewpoint, it's easy to appreciate how RAF pilots flying over Watford less than ten years hence would consider the urban area to be made up of parkland as much as industrial or commercial uses. This famous old factory was a feature of the local landscape, in addition to being a major employer throughout 150 years, from 1830 until 1980. A fine view looking north and west over the historic core of Watford, featuring many of the principal landmarks of the town, which appear to have survived six years of war. 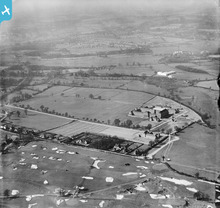 RAF pilots used to remark that Watford from the air in the 1940s contained plenty of open spaces and hardly resembled an important industrial centre. In fact, more bombs fell on the rural surroundings than on the town itself, perhaps reflecting upon the proximity to London. 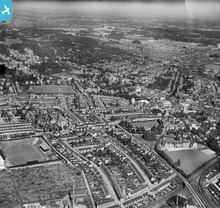 A splendid image of Watford, looking north-east from West Watford just a year after the end of the Second World War, when the town's population had topped 65,000. Despite experiencing bomb damage, both from high explosives and incendiaries, throughout the hostilities, this part of the urban area appears to be relatively intact. A varied and interesting scene at the southern extremity of Watford and the adjoining areas of Bushey and Oxhey. 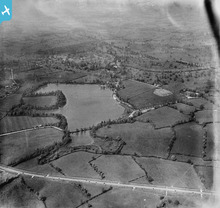 The site of these gravel pits is bounded by Hartspring Lane on the left and what is now the A41 (running left to right in the bottom third of the picture. The site now houses COSTCO, Hilton Hotel, a Traveler site and Winfield Garden & Building Supplies. 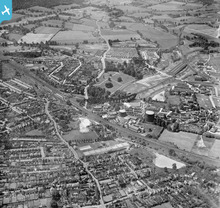 Patchetts Green is to the right of centre in the photo. 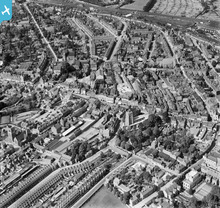 All past and present inhabitants of SW Herts should be able to identify with this image of Watford in its prewar heyday. 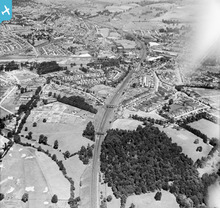 An interesting comparison with the earlier 1926 shot of a similar area and the obvious use of the new A41 route on the eastern side of Watford. 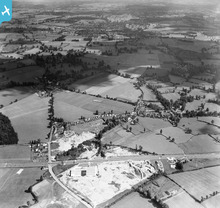 A rural scene less than three miles from the centre of Watford, with major changes taking place in the road network in the form of the Watford By-Pass/North Western Avenue, completed in 1926. 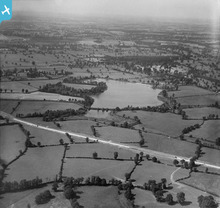 Further changes were due to take place in the 1960s, notably the construction of the M1 Motorway. A popular image for inclusion in this group which has attracted plenty of comments in the last while. This is an attractive picture of the old town of Ricky seen from the south and with the former LMS station on Church Street, at the terminus of the 1862 LMS branch from Watford. Despite living within one mile of this short branch line, on the postwar housing estate at South Oxhey, I never witnessed a single train on this track between 1953 and 1962! However, I've walked the popular Ebury Way on several occasions once the tracks were eventually removed in the 1980s. 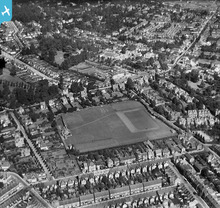 At the time (1932), this was the main cricket ground in Hertfordshire, hosting the Minor County match with Norfolk on July 13 and 14, in addition to West Herts being one of the strongest club sides in the district. 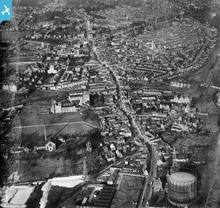 Altogether, this is a fine, clear image of a well-known location in central Watford, which has remained intact to the present day despite the huge postwar changes in transport links and urban landscape in the vicinity. 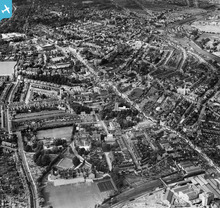 Another exceptional image of the urban core of Watford during the early 1930s, when the total population topped 56,000, and would continue to grow throughout the decade to reach 65,000 by the outbreak of hostilities in September 1939, an overall increase of almost 50% since 1919. 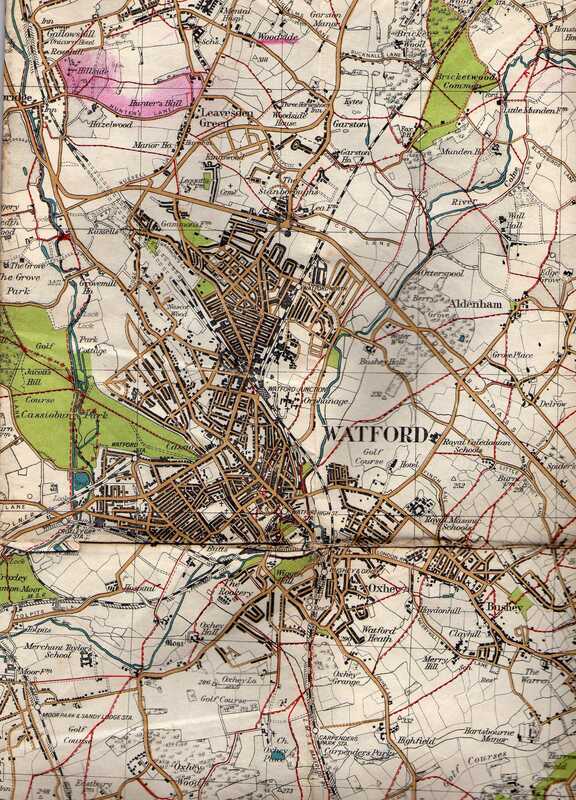 The Watford Fieldpath Association was formed in 1899 and a series of useful maps, on a scale of two inches to the mile, from 1902 into the postwar period. The extract shown here is reproduced from the 1938 Edition. 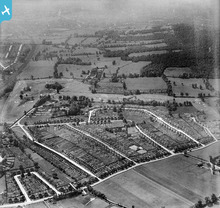 An excellent view of the area between Oxhey, Bushey and south Watford, with an interesting mix of land uses in the period immediately prior to World war II. 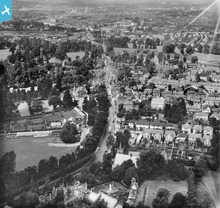 An attractive shot of Bushey High Street looking north-west towards Watford. 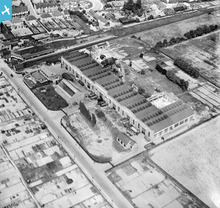 This fine image of the 1922 works at Scammell Lorries, West Watford, is worth including because of the importance of the factory as a major source of employment from 1922 until 1987. 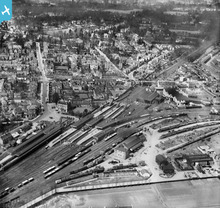 Any group relating to the growth and importance of Watford must surely include a picture of the Main Line station at Watford Junction and this is probably the clearest image available on the website. This image could justifiably gain inclusion in the "Railways" group selection, but suffice for the time being for it to be included in the "Watford & District" group, as it displays a pleasing mix of urban land uses at the south-east end of the town. 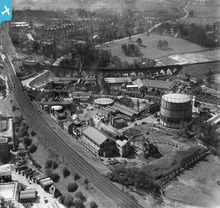 I can still smell the distinctive aromas of this part of SW Herts in the 1950s: the sweet airs from Benskin's, mingling with the gasworks and the sulphur-laden pollution from the nearby railways. 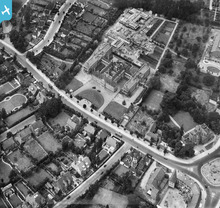 I'm inclined to suggest this image for inclusion as it features a well-respected landmark in the central Watford community and shows the Town Hall area just prior to the construction of the new municipal offices which were opened four years later. The famous roundabout is already in place, a location well known to this correspondent in the 1950s. 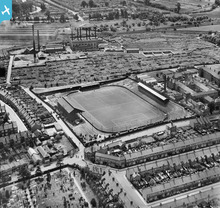 This is a rare view of the famous stadium at Vicarage Road and the home of Watford FC for about ten years when this picture was taken. It's also worthy of inclusion in other groups on this website, such as "Football Grounds". In the background is the 1897 electricity generating station, with coal brought in from the north Midlands, via a railway siding, which served the town until the late 1960s, when it was demolished in favour of a new gas/oil power station. 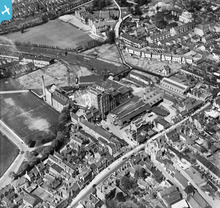 It is gratifying to know to older Watfordians that two of Watford's Grade I Listed buildings, St.Mary's Parish Church and Holy Rood RC Church remain extant despite all the post-1960 changes that have been inflicted on the town. 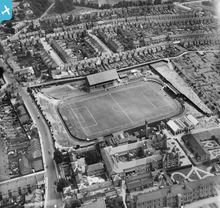 A fine image of Watford from its prewar heyday. 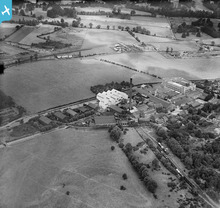 As a major employer in Watford until the 1960s, Benskin's Brewery is worth inclusion in a group featuring Watford during the interwar years, 1919-1939. A pic as fine as this one could gain inclusion in several groups which have already been formed, but it well worth adding this image to the growing collection on the Watford and SW Herts site. Another sharp and detailed image which, again, has attracted plenty of comment from viewers, including the not-so-ordinary bloke from Bushey Meads! I hope he, among others, will consider joining this group in addition to those they are already members of. 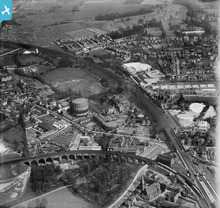 There seems to be a lot of interest shown in the photographs of the SW Herts area, which, in common with many parts of SE England, has undergone considerable change in my lifetime of almost 70 years! An intriguing image which has attracted plenty of attention from individuals in the last while and is thus considered to be worthy of inclusion in this group. 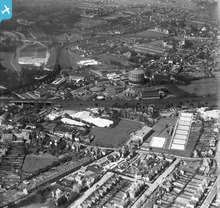 Watford continued to grow into a prosperous manufacturing town, from 45,000 in 1921 to 65,000 by the outbreak of World War II in September 1939. 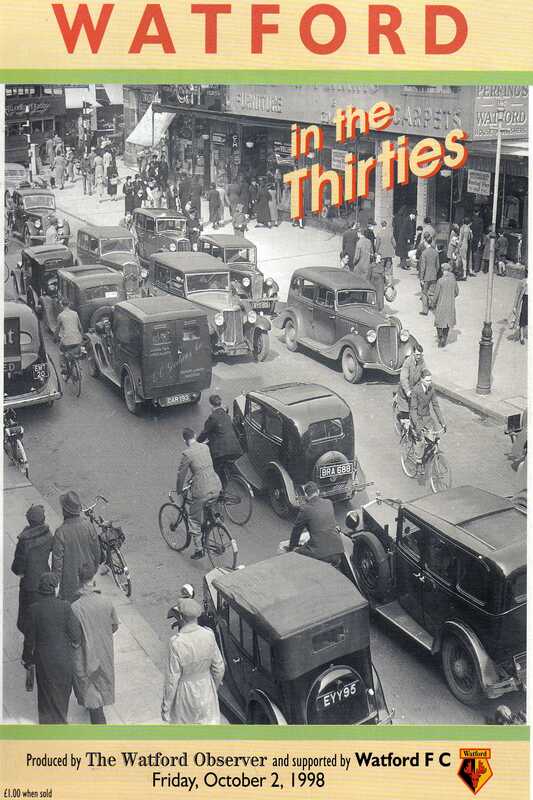 In this picture from the front cover of "Watford in the Thirties", a "Watford Observer" supplement from October 1998, the congested High Street is shown on the approach to Clarendon Corner in April 1939, between Buck's and W.H.Smith's. As Bob Nunn comments in his "The Book of Watford", 2nd Edition 2003, on page 217, the parking problem, which occupied councillors' minds during the decade, was solved by wartime restrictions, until the problem resurfaced in postwar times. The writer of this Comment had several experiences of struggling in such congested street scenes during the Fifties, both on foot, on a bicycle and on board the 346 bus to/from South Oxhey! 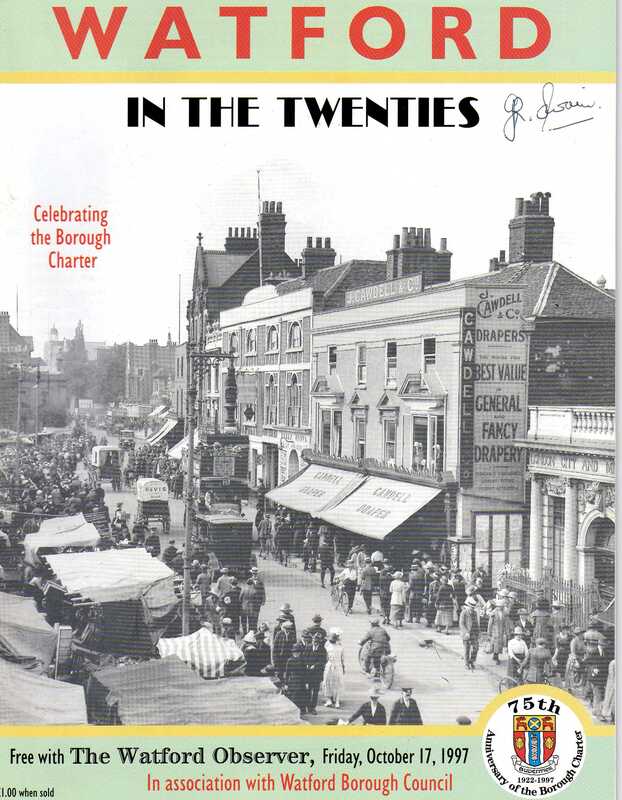 During the 1990s, the "Watford Observer" published a popular series of supplements and a pair of covers are reproduced here, with the first cover depicting a Twenties' market scene in the High Street. 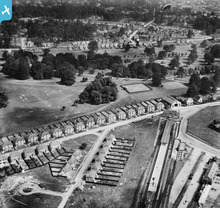 A view of the trimmed down Cassiobury Park taken during the same year when Cassiobury House was finally demolished and shortly after the November 1925 opening of the Watford Met Station, which itself is destined for closure in three years'time, when the new Croxley Link becomes operational. 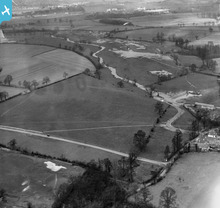 During the interwar period, Watford continued to grow as further areas of Cassiobury Park and the surrounding farmland were developed for housing. 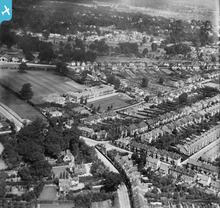 The Cassiobury Estate had been laid out west of Hempstead Road and the 1925 extension of the Metropolitan Railway to Watford station encouraged more suburban development south of the park. 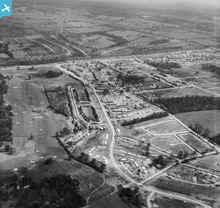 In the northern outskirts of the town, the building of the Council's Harebreaks Estate was followed by the construction of privately owned, semi-detached housing. 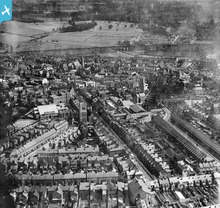 Watford grew between 1920 and the outbreak of war in 1939 from a medium-sized market town of 45,000 to a thriving industrial and commercial centre approaching 65,000 in size. 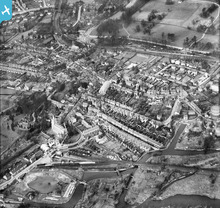 It was arguably one of the most prosperous towns in the south of England and colleagues are recommended to consult the numerous images on this website which depict the settlement in its heyday.